Sugar-Free, 100% Natural, No Artificial Flavors, these are all common catch phrases we see in the grocery store isles on the front labels. These phrases are meant to grab our attention and prompt us to pick it up off the shelf, put it in our baskets and buy! A lot of people are caught and tricked by these marketing tactics. They are often very deceptive and cause one to believe they are getting a quality product when in actuality they are not. These marketing strategists know what key words people are looking for and also know that most people won’t turn the product over and take the time to see what they’re really getting ready to buy. Although they may claim something is sugar-free, what are they substituting the sugar for to sweeten the product? Probably with something more dangerous than sugar! The word natural is very generic and it could mean really whatever the manufacturer wants it to mean. Sure a product may not contain any artificial flavors but does it have artificial coloring (red dye, blue dye, yellow dye)? If you really want to know what you’re getting you must read the back label. This is the real truth about your product. Generally, the first 5 ingredients are what your product primarily consists of, but it is important to read all ingredients on the label. This not only applies to food, but also personal care products and anything else that we put on or in our bodies. Some personal care products may be marketed as healthy because they contain natural substances like olive oil, tea tree oil, or vitamin e, but when you turn the product over you see about 12 ingredients listed with the promoted natural substance being the 12th item on the list, and something like water or mineral oil being the 1st! So you’re really getting only a trace amount of the substance marketed on the front of the bottle which means the quality of the product is not as high as it appears to be! ü After the front label draws you in, turn it around and read the back label! We have all heard that patience is a virtue. It is the ability to accept delay without frustration. Those with patience are able to remain calm and avoid sudden impulses when under pressure. Being impatient has little benefit; whether it’s a traffic jam, a long line at an event, or a slow clerk at the grocery store; you may as well sit back, enjoy your music on the radio, enjoy your companion in the line, or offer a friendly smile to the frazzled clerk at the store. Make the best out of the situation! Patience is beneficial to your health, happiness, relationships, and goals. It’s easier to be happy when you’re patient. Impatient people are often experiencing stress and anxiety, on some level so having patience reduces this unpleasant state of mind. Challenging situations are more manageable when the situation can be approached with patience. Patience promotes good health. The stress that impatient people feel is harmful to the mind, body, and emotions. Heart conditions, chronic headaches, ulcers, and many other health conditions are often the result of stress. Those that exercise patience often suffer from fewer medical issues, potentially increasing their life span. You can accomplish your goals. Some goals require a certain amount of time to manifest, and for this you need patience. People often times quit and never accomplish their goals or see their dreams come to pass, for lack of patience. Have you allowed impatience to sabotage your destiny? You’ll make better decisions. Impatient people tend to be impulsive; therefore, don’t take the necessary time to make wise decisions. Patience provides the time and space to ponder the situation and make a wise decision. Do you recall a time in your life where you’ve made bad decisions due to being impatient? If you think about it, being impatient doesn’t do anything to help your situation, in fact it can make a challenging situation a whole lot worse, stealing your peace in the process. Relax, take a deep breath, and remember the virtues of having patience! I’m sure you’ve all heard the saying that “Laughter is the best medicine.” Have you ever wondered why or how? Laughter is beneficial for your health, mood, stress, relationships, and others around you. Strengthen your health. The more you laugh, the less frequently you’ll be sick. Studies have shown that laughing strengthens the immune system and lowers your blood pressure, improving the health of your brain and heart. Decrease stress. Daily life can be stressful at times. Laughter is a very good way to reduce stress. When you have a good sense of humor, it’s easy to find reasons to laugh about life and temporarily forget about your challenges for a moment. Elevate your mood. 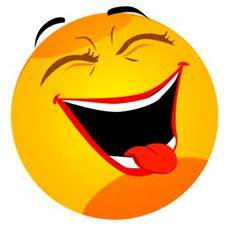 Laughter increases endorphins which make you feel good, these feelings can last for hours. Finding the humor in situations can redirect your focus from what’s negative, to something more pleasurable. Benefit others. Laughter and humor is contagious. Your smiling face and light mood can uplift and brighten the moods of those around you. Your relationships will also benefit from your ability to laugh and appreciate the lighter side of life. Boost your intelligence. A study demonstrated that laughing stimulates the learning centers of the brain, which if done on a regular basis, is believed to enhance the ability to learn new information. Hopefully now, you can see how laughing and smiling aren’t frivolous gestures, but offer tremendous benefits to you and those around you. Enjoy funny movies, tell a joke- make it a point to find the humor in life, and spend time with others who enjoy laughing. Even if you can’t find anything to laugh about, start with smiling and see what happens! Follow Your Heart OR Not? Follow your heart they say. It’s a nice saying, that makes us feel warm and fuzzy inside, but really, is this a good idea? Let’s think about it. Your heart is where your emotions dwell, it’s a part of your soul. It’s our feeler center, where we experience love, hate, anger, bitterness, happiness etc., Because we are human, it is a natural inclination to want to follow our feelings or our hearts. Go with what you feel, right? Or not? If everybody did what they felt like doing, our society would be in a bigger mess than we are today! Unfortunately, the things that we are seeing play out in society today are just that, people following their hearts and being led by their feelings. What’s in our hearts provides the fuel for action. Every school shooting and terrorist act was carried out by someone who had hatred and bitterness in their hearts, which provided them the fuel to carry out these horrendous acts. We often think of this saying when it comes to matters of love. But even then, simply following your heart is not something wise to do. You can love someone that is toxic or simply not for you, but because those feelings are there and you’re ‘following your heart’, this can lead you down a long, empty, and maybe even dangerous road. God, the Creator of all, says it best in the Bible where He warns us that the heart is wicked and to guard our hearts with all diligence. So the next time someone advises you to follow your heart, think again! Coconut oil is one of those household items that you want to keep in stock at all times. It is inexpensive, goes a long way, and has multiple uses. Use it to sauté your vegetables or meat. Not only is it a healthier alternative to more commercial oils, it also packs a lot of flavor, enhancing the taste of food, requiring less seasoning. The next time you want to stir fry some shrimp, chicken, or veggies, give coconut oil a try. Use it as a skin moisturizer. Coconut oil is packed with Vitamin E which is beneficial to the skin. It is also anti-microbial, so various skin conditions like eczema or psoriasis are often improved with the regular use of coconut oil. Use it for hair moisturizer. Again, it is an excellent moisturizer so dry, damaged hair and scalp is nourished with coconut oil. It is not a heavy oil, so it will not weigh the hair down like a synthetic moisturizer. Use it for your oral hygiene. I wouldn’t necessarily suggest brushing your teeth with coconut oil, but you can periodically rinse your mouth with it (known as oil pulling), where you swish about a tablespoon of the oil in your mouth, pulling it through your teeth for about 5-10 minutes; to help keep your mouth free of germs and bacteria. Use it for your dog. Yes, our furry little friends can benefit from coconut oil as well! You can add a few drops to their food which will can help improve their coat and skin. It also adds some nice flavor as well. AND…we know how much our dogs like getting their teeth brushed, well you can actually use coconut oil to brush their teeth! They love the smell of it, so they will be more accepting of that toothbrush going inside their mouths! These are just a few of the many benefits to coconut oil. Make sure you get ORGANIC coconut oil in order for the above benefits to apply, and read the back of the label to make sure! Anything else will be imitation and loaded with additives and chemicals reducing or removing the benefits. The timing of God is a mystery. His timing is not our timing. Often, we want what we want when we want it, with no regard for anything else. Timing is a protector for us most of the time. God knows that if He gave us what we asked for when we asked for it, whether it be riches, power, love, or any other desire of our hearts, we would ruin it! Most of this is because we are not ready for what we are asking for OR all of the ingredients to fulfill this request are not quite in place yet. The right business partner may not totally be free from their current commitment yet, the right house may not be on sale yet, the right spouse may be cleaning up some loose ends in their lives so that when you meet, there will be no hindrances. The list goes on and on! We can’t expect that everything will fall into line when we want it to. God sees all and knows all, and we have to accept that He knows best and is working everything out for our good. He is working behind the scenes on our behalf to pull all the pieces of the puzzle together so that when He does grant our desires, the necessary pieces will be in place to support us with the blessing, so that we are able to enjoy and sustain it! I know, I know, we kick and scream and wonder what more can we possible do to get ready, or how can we speed things along. But this only leads to frustration, disappointment, distress, and eventually hopelessness. As challenging as it may be, we must learn to humbly submit ourselves to God’s will and accept His timing and plan for our lives, knowing that when He does fulfill His promise, it will be so much better than we ever expected it would be. Remember God’s delay is not God’s denial. Everything will come to pass according to God’s purpose in His divine timing. The Path to Greatness is not an easy road to travel. It is unpaved, narrow, barren, and bleak. It is long and dark and seems as though it goes on for miles with no end in sight. It seems useless, pointless, as though you’re making no progress. No people in sight for miles, with a glimpse at someone trudging along this long, winding road every now and again. There are twists and turns, hills and valleys, sometimes it seems like you’re going in circles or moving steadily but getting nowhere. The thought of quitting and turning around to travel on a road that’s more familiar, more comfortable, tempts you every day. But then you remember all the hurdles, struggles, obstacles you’ve overcome. All the strength, endurance, courage, determination, and perseverance you’ve acquired along the way. Then you realize you’ve come too far to quit-all of your efforts would be in vain if you don’t move forward to see the rewards of your labor. You tell yourself-keep pressing ahead, don’t quit, don’t worry, don’t fret. My dreams will come to pass; my labor is not in vain. For it is then that you realize why the path to greatness is the road less traveled. It is cumbersome, it is treacherous, it is hard, and it is not built for the common man-the common man won’t last. Those that travel on this path to greatness that make it to the end, are not ordinary, they were built to last, This is what make them great. No matter how treacherous the path may be, keep pushing through to the end, greatness is a part of your destiny.